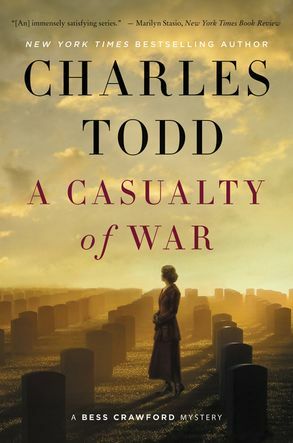 A CASUALTY OF WAY by Charles Todd is a winner. This Bess Crawford mystery has the war coming to a close. The story explores the impact World War I had on all who witnessed it: officers, soldiers, doctors, and battlefield nurses. In this novel Bess becomes the champion of Captain Alan Travis. She meets him near the front lines in France at a forward aid station after he suffered a head wound. He confides in her that he thinks his cousin, Lieutenant James Travis, shot him. To make matters worse after going back to the frontlines he is shot again, this time in the back. Because no one believes him and thinks his rage is due to shell shock, they incarcerate him in a ward for the mentally ill. Being from Barbados without any family support he begs Bess to help him. Although she is not sure his accusations are true, she is sure that the medical diagnosis of shell shock is wrong. With the help of her friend and her father’s former aide, Sergeant Major Simon Brandon, she journeys to James’ home in Suffolk to learn more about the cousins’ relationship and to hopefully enlist the support of the relatives. It is here that the mystery takes off.